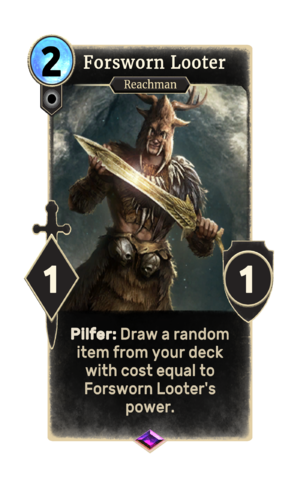 Pilfer: Draw a random item from your deck with cost equal to Forsworn Looter's power. Forsworn Looter is an epic Neutral creature card. It is part of the Heroes of Skyrim expansion. "We'll use any tool to defend the Reach!" This page was last modified on 27 February 2019, at 19:39.